Mobile Infamy Reviews cover mobile and handheld games. For mobile, MI only cover Android games, as my distrust of all things Apple-related is prolific and well documented. 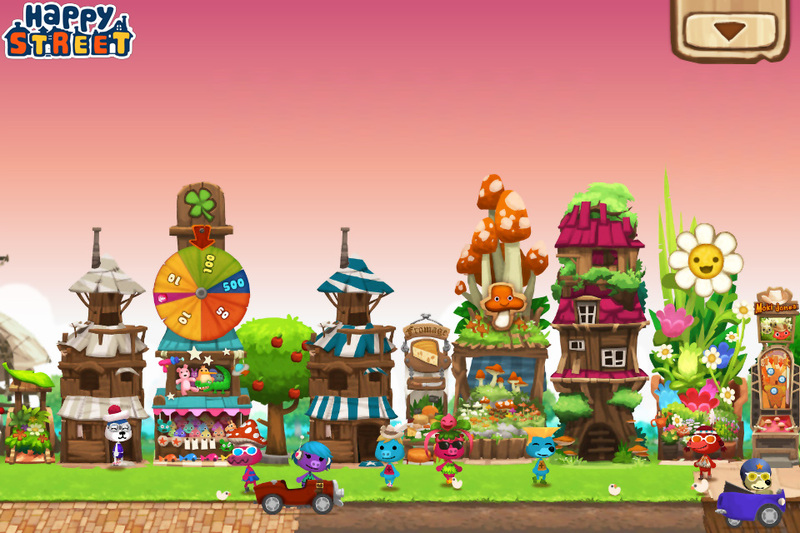 Happy Street is a unique game for Android and iOS systems. The premise of the game is simple–a young fox named Billy is wandering through the forest and decides that this particular spot would make a good place for a street. You build houses and shops and decorations, and people inexplicably move in, and start driving down your street, which is in the middle of the forest. You earn money from the shops, and restocking the goods in the shops is what grants you experience. Levels in the game are used as a mechanism to lock to certain builds till later in the game, and outside of that has no influence on game play. There’s some minor resource managing, and as with most mobile games, time is your primary resource. Many of the later items in game can take many hours to complete, the only way to speed them up being the in-game premium currency, ‘Flooz’. I’m not sure where they got the name for that. Flooz is also what you have to have expand your street. You start out with just a little stretch of road, and gradually expand it. The cost to expand increases each time. Luckily, you can earn flooz in game without having to purchase it — there are mini-games like a slot machine that you can play once per day that grant you at least one flooz, and visiting friends and helping them also grants you a flooz. So if you have a bunch of friends all playing at the same time (it uses Facebook to find friends), flooz might not be a big deal. If you don’t … you’ll probably end up forking over some cash to progress. The game really does have a lot going for it. It’s somewhat of a cross between Animal Crossing and SimCity. The music is inventive and upbeat, the graphics are pretty endearing if cartoon-y. Despite having the veneer of children’s game, there’s a lot of adult humor hidden in the game’s dialog as well. In the beginning, the pacing is pretty good and kept me in the game. There was also something to do, whether checking on something I was crafting in game, restocking my stores, trying to build up “love” to get a fiesta in-game, which is basically a self-induced Black Friday mad rush, just without as many injuries. There are quests that move the story line along, but I think story is one of the weak parts of this game (see below in Cons section). There were some fun one-off things to do as well, like making the birds the occasionally fly over head either poop on your resident’s heads, or poop on the side walk, inevitably making them slip and call. It should be noted, that making the bird poop on someone’s head grants you gold. Your resident’s also occasionally seem to forget where stores are on your street, and will walk around with a store sign over there head — tapping on them, they tell you which store they are looking for, and then tap the store, and they will run over there. They do the same thing for other residents on the street. Doing this nets you some gold or some towards your next Fiesta. While nothing is overly engaging in and of itself, the whole packages adds up to something I found myself wanting to spend time in…at least in the beginning. Happy Street slows down as you progress….a lot. This is no doubt due to the developers wanting you to spend money on the game, but … eh. I find that it breaks the game for me. Once I hit the mid-high levels, things starting taking 24 or more hours to do, and I couldn’t expand my street because the flooz cost was too high. At the time I quit, unless I forked over some cash, it would have taken roughly a month of logging in every day and doing the few tasks that awarded flooz to have enough to expand my street. That combined, with 24hr build times really broke the engagement for me. I didn’t want to log in every day, so I didn’t. I logged in every other day, every 4-5 days, once a week, and now – virtually not at all. Secondly the game didn’t really develop at all. Once you figure out the formula, it became rote and stale. There were no new developments in the game, nothing became more challenging. After a certain point, it literally just became my stubbornness to hit max level, then I realized that I didn’t care and it stopped all together. It goes without saying then that the game-play gets repetitive, and the game feels more like “just give me your money NAO…” as you get later into it and less about enjoying the game. But more than anything, the pacing falls flat on its face later in the game. Happy Street is a good distraction for a few hours. The early – mid-levels are a lot of fun, really engaging, and just generally a good time to play. Once you hit the upper-mid and high levels however, the game face-plants. The pacing is shot, game-play because so stagnant that even with paying for the premium currency Flooz, it still feels rote and repetitive. Next ›I just learned a hard lesson ….